LPA Inc has designed the offices for mobile game creators MobilityWare, located in Irvine, California. MobilityWare is a highly creative, fast-growing game design company that specializes in casual mobile games for players of all ages. LPA had the opportunity to work with the gaming firm on their previous offices. Continuing the path of rapid growth, MobilityWare expanded this year into an additional 20,000-square-feet of office space. In this office, two entirely different types of workers coexist. The Business group is housed on one side of a large break room, in a light, bright space with fairly traditional private office build-out. The Design and Engineering team flanks the other side of the break room in a dark, private environment, configured into working pods of 10 team members. This group has specialty lighting controls to adjust key aspects of their environment to support their work process. Multiple specialized spaces, called “scrum rooms,” hold more than 20 team members in a standing-room only space and are complete with writable surfaces and large LCD screens. These large brainstorming rooms allow teams to develop different aspects of their games. 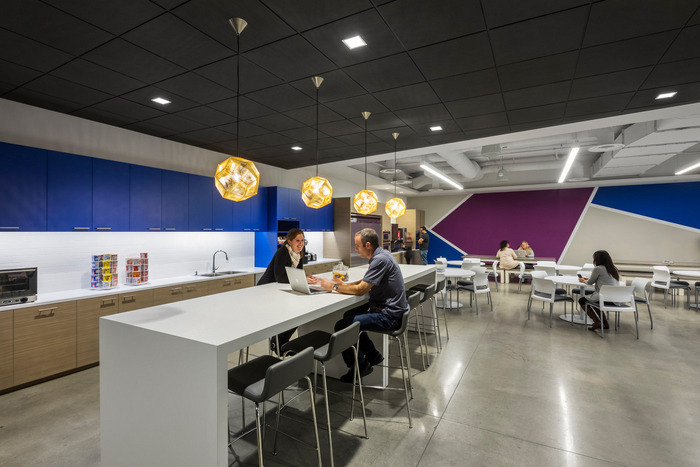 To unify the growing firm and convey their creative culture, vivid colors and art were pulled from their games and used extensively throughout the space. A large, multipurpose break room is frequently used for town hall-style meetings. Finally, diverse areas—from phone booths and study alcoves, to communal tables, a pool table and rock climbing wall—offer variety and encourage both interaction and zones for heads-down work.